In the 1980’s and 90’s, Medellin was considered one of the most dangerous cities in South America. It was home to drug lords such as Pablo Escobar, and its reputation was synonymous with big time drug cartels and violent crimes. 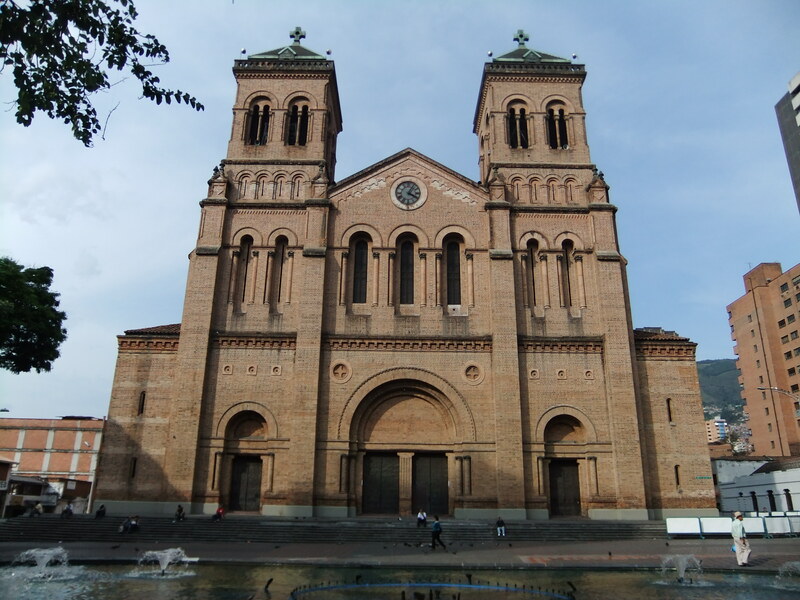 Today however, Medellin has cleaned up its act, and is an incredibly welcoming city, with a busy downtown core and neighborhoods with character! The Poblado district, where we stayed, was one of the nicer neighbourhoods we’ve explored on this trip, in fact. The area was full of well kept, charming parks and loads of restaurants serving international and local cuisine. On our one and only full day in Medellin we decided to explore as much as possible; we started with checking out Pablo Escobar’s grave. 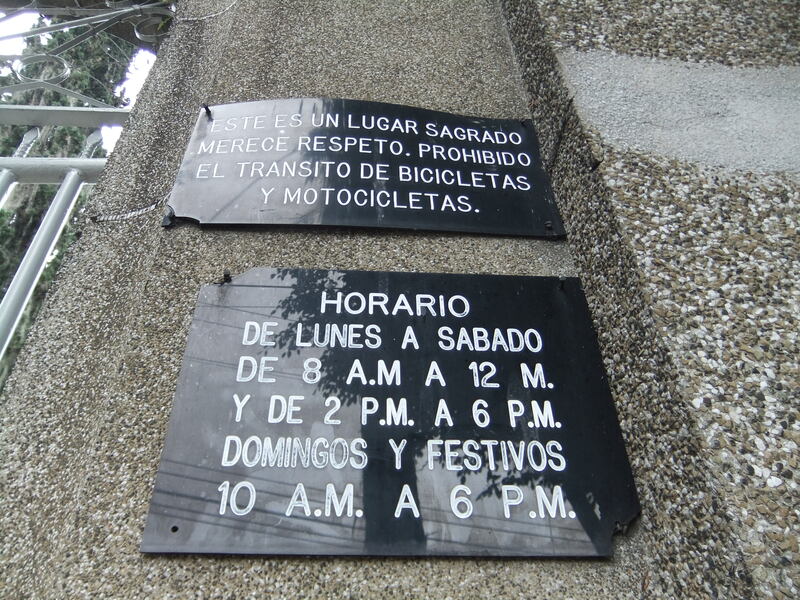 We took the metro to the designated stop and immediately realized that finding the cemetery would not be easy. The station was right in the middle of a busy neighborhood and no cemetery-esque areas were visible. Luckily we had all afternoon, so we just started to walk through the streets. After a while, we admitted we were lost and asked a little old lady where the “cementerio” was. She pointed up and down blocks, told us to turn left and then right and we’d find it. So we carried on. After stopping 4 times to ask directions, and each time getting a completely different answer, we found it! 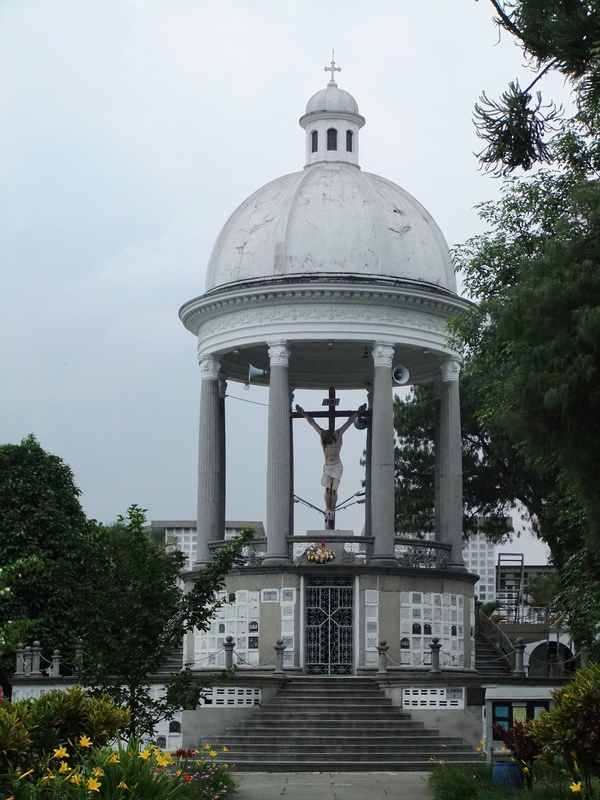 A huge white building with a statue of Jesus on the cross was right in the center of the place. 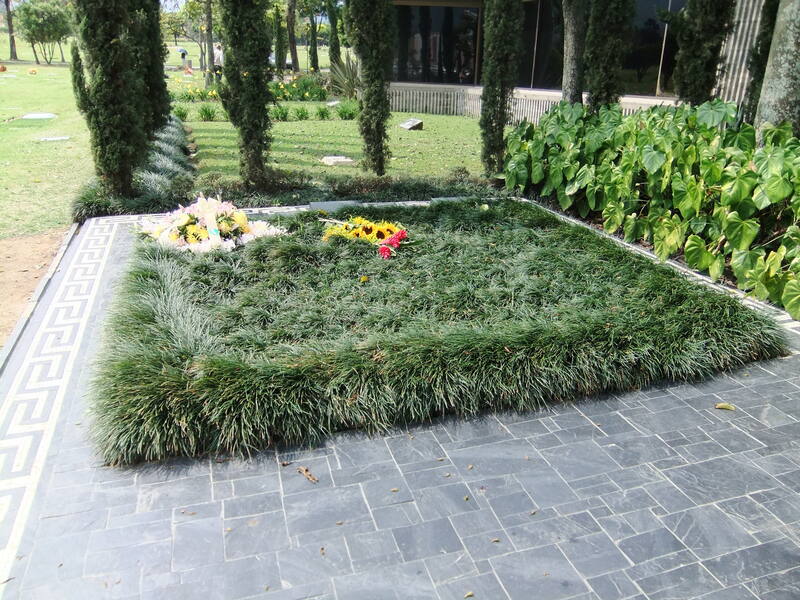 From there, thousands of plaques with cremated remains spread outwards in a giant maze. It was going to be a daunting task finding the right grave. Unfortunately, as we went to open the gate, we found a big lock on the outside. Next to the gate was a sign that read: “closed from 12:00 to 14:00”. 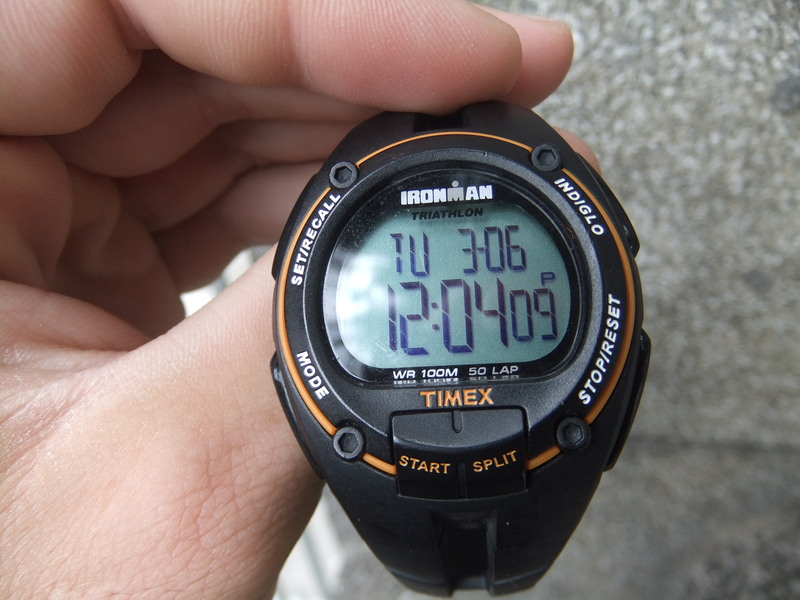 We looked at Adam’s watch… It was 12:04. Fantastic. So we grabbed a couple drinks at a local bar and waited out the two-hour siesta break. As soon as the cemetery opened we were in the gates! 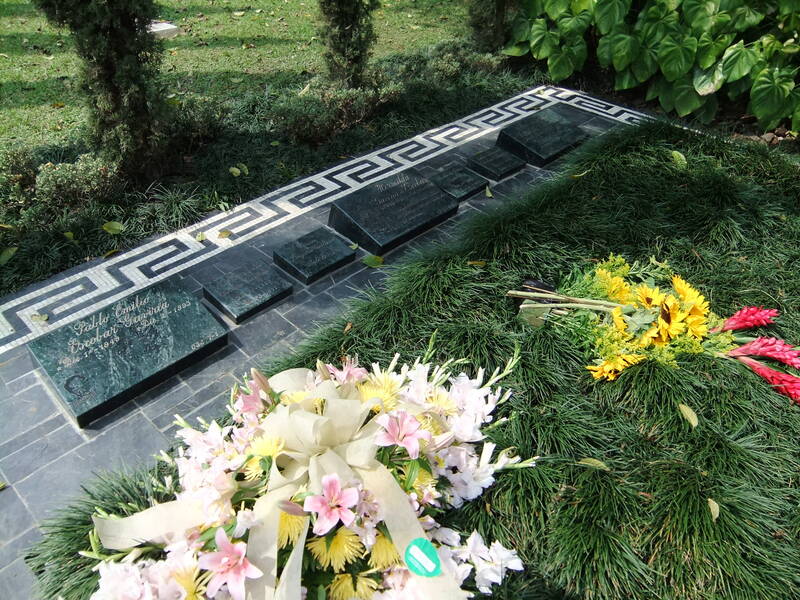 The place was a little overwhelming with the number of names, and there was no touristy indication that Pablo Escobar’s grave was the center of attention. So we walked and read, walked and read and after way too long searching, we came across two guys that worked there. We asked them if they could help us find Pablo Escobar. They looked at us like we were crazy, then the younger guy perked up. “Pablo! !” he laughed hysterically, “you are in the wrong cemetery my friends! You are looking for the big one. It’s huge, with a big building and big monument!” Seriously? We’d been sitting around for over 2 hours waiting for this cemetery to open and all for nothing? So even with directions we decided to take a cab; we specifically asked for Pablo Escobar INSTEAD of cemetery, and the driver took us right there. So much simpler for a 2 dollar cab ride! 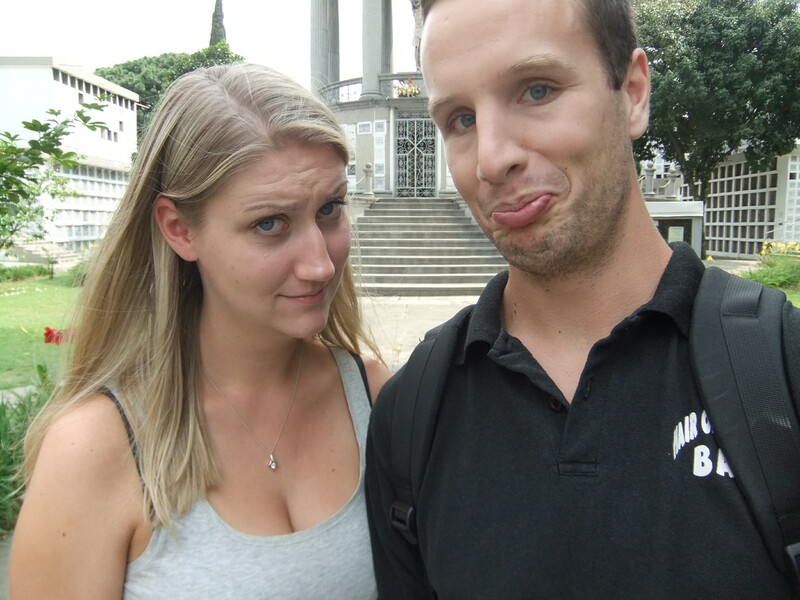 Our sad faces when we realize we’re at the wrong cemetery. The taxi driver pointed over to a large building across the cemetery and sent us on our way. We felt so stupid. The place was huge! And the building that he pointed to had a tonne of cars, a bus and people milling around. Obviously it would be a tourist destination, and not a desolate old cemetery in the middle of the city! So we walked toward the building determined to take a photo and get on with our day of sightseeing (now that we were so far behind on our day). Stoked to have finally found it! So we walked into the building like the biggest tourists ever: cameras out, backpacks on, ready to throw elbows through the crowd to get a picture and get out. We smiled at a security guard on the way in the building and he looked at us strangely before smiling back. Then we moved our way through a group of people into a room that everyone was staring into. When we walked into the room, we walked STRAIGHT into the middle of an open casket funeral that was going on. The dead man’s wife was wailing over the casket and about 90% of the people in the room were crying: then there was Adam and I. The only gringos in the whole area, who just pushed through a grieving family with our cameras out, determined to snap some shots. I went so red, and the ridiculousness of what just happened made me want to laugh out loud: although I’m sure that would have made things worse. So we hightailed it right back out of the funeral and back to the front door with the security guard. “Pablo Escobar?” we asked. He just shook his head, smiled a bit at us, and then led us to a very modest sized family grave on the backside of the building. How MORTIFYING! It took us a total of three minutes to take a photo, check it off our tourist list and head back towards the metro…3 and a half hours later. Fail. The downtown core of Medellin, our next destination, had a great ambience. Street venders lined the main street for block after block selling their goods: pirated dvd’s, music, clothing, trinkets and street food among many others. We walked the main drag for a good stretch before coming across a beautiful plaza. The city itself is so much more beautiful than Bogotá, and the vibe is both livelier and warmer. Later in the evening, we asked a man for directions to a restaurant. When he realized that he’d given us the wrong directions to the place he left his shop, and ran down 5 blocks to find us and let us know the right way. It’s unfortunate that Colombia, and in particular Medellin, has such a bad reputation, because the people are so lovely and accommodating. 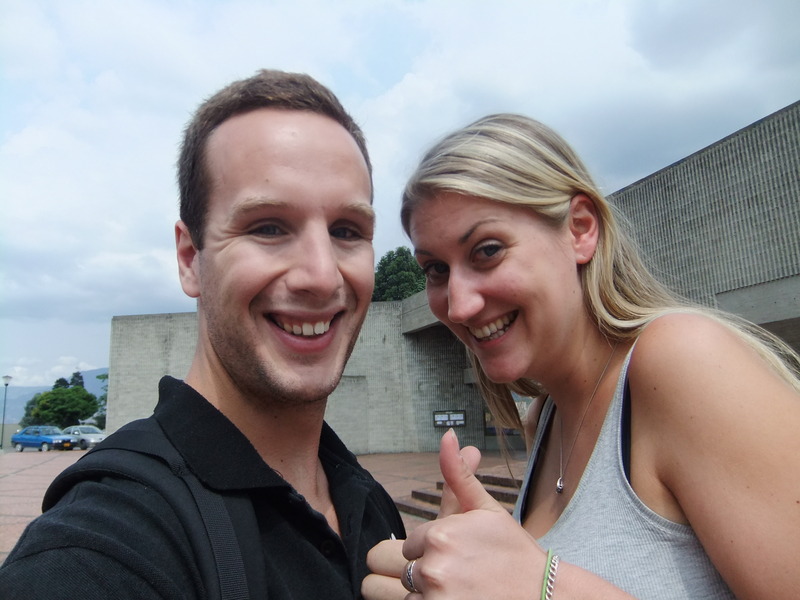 All throughout the country we were surprised by how friendly and helpful all the locals were to us! I suppose that’s why Colombia’s new tourist tagline is “The most dangerous part of Colombia, is not wanting to leave”. And I believe it! 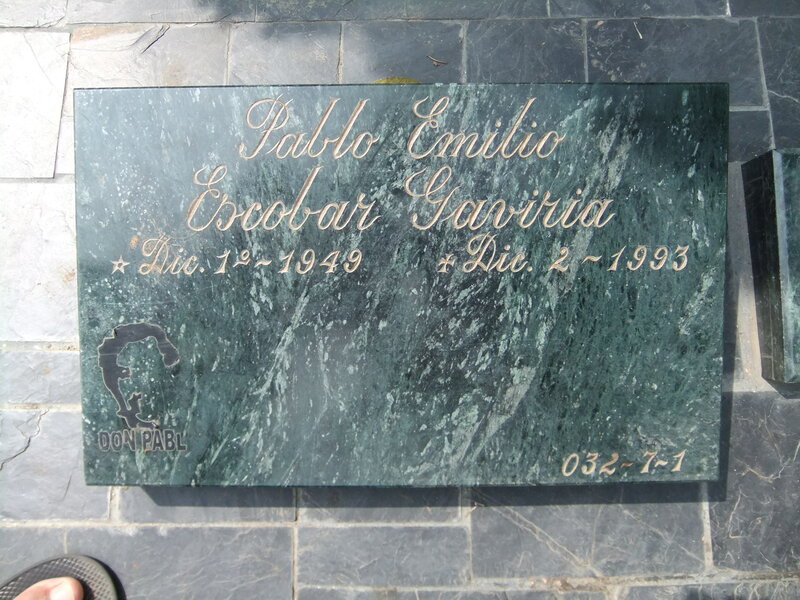 This entry was posted in Colombia, South America and tagged Cemetery, Colombia, Drug lords, Medellin, Pablo Escobar, Poblado, South America, Travel by hilarylust. Bookmark the permalink.